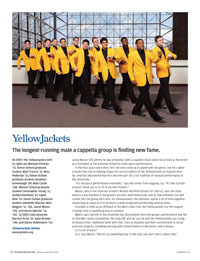 YellowJackets The longest-running male a cappella group is finding new fame. Jamal Moore ’12E admits he was unfamiliar with a cappella music when he arrived at Rochester as a freshman at the Eastman School to study opera performance. In the four years since then, he’s not only come up to speed with the genre, but he’s taken a leadership role in helping shape the current edition of the YellowJackets as musical director. And he’s discovered that he’s become part of a rich tradition of musical performance at the University. Moore, who is the Eastman School’s William Warfield Scholar for 2011–12, says the close bond is a key element in the group’s success—both historically and as new members are welcomed into the group each year. As YellowJackets, the members spend a lot of time together, rehearsing as many as 8 to 10 hours a week along with performing several times. 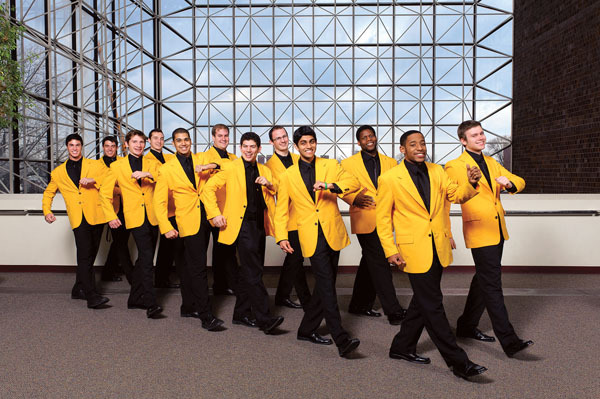 Founded in 1956 as an offshoot of the Men’s Glee Club, the YellowJackets are the longest-running male a cappella group on campus. Moore says interest in the ensemble has skyrocketed since the group’s performance last fall on the NBC reality competition The Sing-Off, and he says he and the YellowJackets are trying to balance their newfound fame with their lives as students and their commitment to social outreach projects, including working with schoolchildren in Rochester and in Kenya.